We were over at our good friends’ house, having just eaten a delicious meal and were playing a fun round of the board game “Ticket to Ride,” when it was suddenly time for dessert. Our friend pulled out a lovely dish from her oven containing saucy blueberries and proceeded to serve it up with vanilla ice cream. 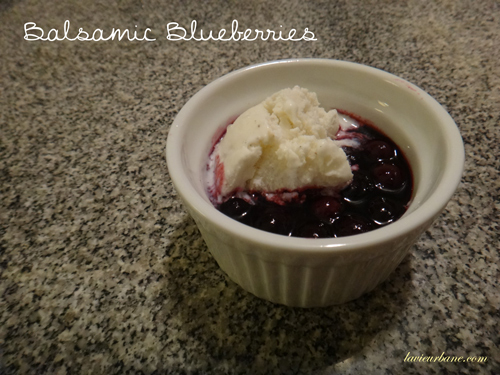 We were stunned to find out the dessert we had been smelling was blueberries cooked with BALSALMIC VINEGAR! You may think this sounds a little strange or off-putting…. well, you have to give it a try before you can judge. We licked our bowls clean and helped ourselves to seconds. It was delicious!! You’ll find the recipe here from Epicurious… they combine peaches with the blueberries which I’m sure must be delicious but it’s great with blueberries alone too. It is hands down one of the simplest/quickest desserts to make and sure to be loved by all! I would say it even might be healthy, too. 🙂 I hope you enjoy as much as we did!